Spirulina is part of the blue-green group of microalgae or unicellular cyanobacteria capable of photosynthesis. Formerly called blue algae, it is now known as spirulina because of its spiral shape. Like all algae (kelp, nori, kombu, wakame, chlorella …), spirulina is considered a ‘superfood’ or ‘miracle food’, because of its high nutrient content. It is also used in the developing world to combat malnutrition. Spirulina has long been recognised for its abundance of high quality, fully bioavailable proteins. They actually make up 60-70% of its dry weight and provide almost every amino acid. • natural plant pigments such as green chlorophyll, blue phycocyanin (16% of its total weight) and orange carotenoids (a mix of primarily beta carotene, with cryptoxanthin, lutein and zeaxanthin). • and conversion of phycocyanin into phycocyanobilin, a bilirubin-like antioxidant which protects cardiovascular health. The considerable number of research studies and clinical trials conducted on spirulina across the world continue to expand the realm of its potential benefits. • older people in order to reduce their risk of so-called lifestyle diseases. Depending on the environment and method of cultivation used, spirulina – like chlorella – can be subject to serious pollution (from heavy metals, bromine, radioactive compunds, and various pollutants …). 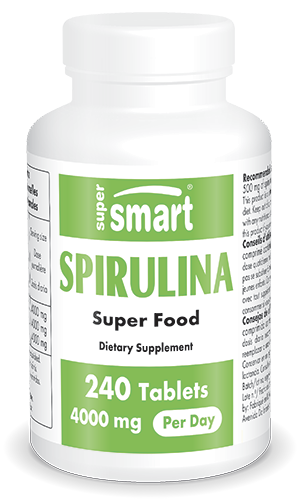 The spirulina sold by Supersmart is the product of strictly-controlled aquaculture from the world’s top spirulina producer, Parry Organic Spirulina. It is therefore completely safe to consume, and is guaranteed to produce optimal efficacy. adults. Take 8 tablets a day. Each tablet contains 498.5 mg spirulina.